Before writing a white paper it's important to think about how you plan to use it. A white paper needs to be genuinely valuable in its own right, as well as presenting a well-reasoned and supported business case: It's a fine balancing act but definitely achievable. And of course…it helps if you know the subject matter. 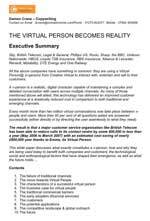 Client: Creative Virtual (and its unique Virtual People® technology). Brief: To write a 5,000 word white paper explaining this technology, its origins and potential - and the client's unique' leadership position. Result: Media, analysts and prospects now know what this technology is all about; driving demand, and leading to a delighted client.